Description: Largest of the North American shorebirds, this species is crow-sized with long, dark legs and a long, decurved bill. Adult males and young have shorter bills than adult females. The bills may be pink to orange at the base of the lower mandible. Look for reddish-brown plumage with dark barring, streaking on upper and lower body parts and fine, even streaking on the head. Markings are more prominent during the breeding season. 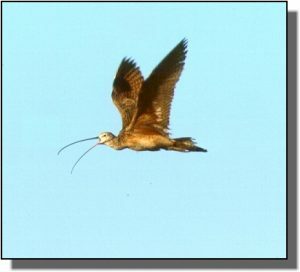 Cinnamon underwings are seen in flight. Similar Species: Whimbrels are smaller, have distinctive crown stripes and are grayer with lighter bellies. 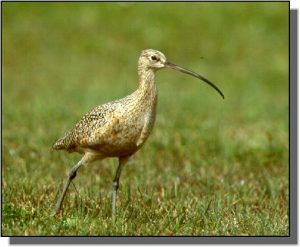 Eskimo Curlews, although probably extinct, are smaller and have shorter, decurved bills. Godwits have straighter, slightly upcurved bills. Comments: This species is found in large tracts of native prairie throughout the western Great Plains. They frequently feed in agricultural fields by probing in the soil or running after grasshoppers and other invertebrates. They also eat eggs and the young of grassland nesting songbirds. During winter, they use coastal areas where their bills allow them to probe deep into sand and mud for crabs.